Located at 157 West 57th Street, One57 is a mixed-use, supertall, skyline-defining tower on Manhattan’s 57th Street, also known as Billionaire’s Row. Each apartment for rent showcases breathtaking views of Central Park and the cityscape. One57’s iconic design was crafted by renowned architect Christian De Portzamparc with a shimmering glass facade. Designed by Thomas Juul-Hansen, apartment interiors offer the finest in luxury finishes. Floor-to-ceiling windows ensure no shortage of natural lighting, and apartments have hardwood floors throughout. The chef’s kitchens are equipped with stainless steel Bosch appliances, and are fitted with Nero Voda marble countertops, Statuario marble details, and wooden cabinetry. Master bathrooms are clad in Bianco Dolomite marble, and feature soaking tubs, oversized mirrors, and double vanities for a spa-like experience. One57 provides its residents with unparalleled services and amenities, including a 24-hour concierge and doorman, housekeeping services, a full-catering kitchen, on-site parking, and valet services. Residents also have access to a state-of-the-art fitness center and pool, screening and performance room, business center, arts and crafts atelier, library, and billiard room. 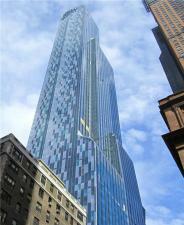 I would like information on apartments in One57. Please contact me ASAP.